Cozy Cabin in the Pines! Beautiful property with lots of space! SPECIAL PRICING! For the months of January-April we are offering a 10% discount on stays of 7 nights or more! Cozy little house on several acres of flat ground just minutes from town. Easy access to this nicely maintained property located on a paved road. The property is well kept with beautiful views off the bluff at the back of the property. 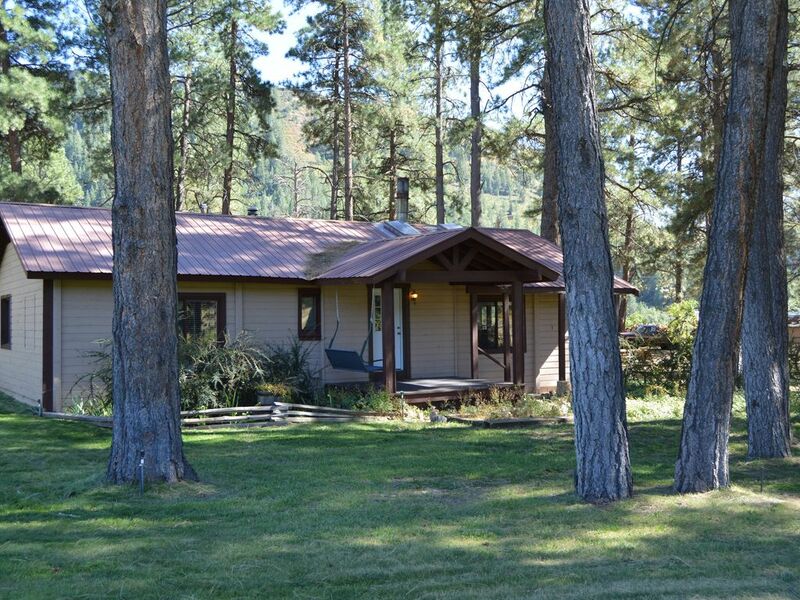 It is an attractive and relaxing setting with convenient access to the many attractions of the Durango area. 5 minute drive to the edge of Durango. 16 minute drive to the Durango & Silverton Railroad. 18 minute drive to Durango regional airport. 39 minute drive to Purgatory Ski Resort. The house is about 1300 sq. ft. and has two bedrooms with and two bathrooms. One of the bathrooms is connected to the master bedroom. The master bedroom has a king size bed and the 2nd bedroom has a queen size bed. There is a nice hide-a-bed in the living room that will allow space for up to 6 people. There is a full kitchen and dining room and living room that is fully equipped with stove, microwave, dishwasher. There are dishes and pots and pans and spices, etc. Also a back deck and front porch that are great for just enjoying the great outdoors that Colorado has to offer! The owners live on the property part-time in a separate apartment that is detached from the main house. They will be staying off the property during the duration of your stay but will be available if you should need anything. We do not have any TV's in the house. Also, if you put in a request or message me on a Sunday it will be Monday morning before I can get back with you. Married couple in their late 50's. Have lived in Durango since 1996. Have owned a business in Durango since 1997. Well established and familiar with the area. There is a water cooler that will keep the house cool. There are some special directions with water coolers such as keeping a window or two open. Directions will be provided upon rental. There is a wood stove for the winter months. Wood will be provided. Seats 8 at the main table. There is a small island in the kitchen also that could seat 4. Some board games stored in hall closet. Great cabin with a great location! Will stay here again! Beautiful cabin with glorious views in the back. Loved the wood burning stove. Short distance out of town. Easy access to Historic Durango. We rode the train and went skiing during our stay. Owners are friendly and responsive. We would definitely stay here again. We stayed at this magical home to celebrate our son's birthday with a ski trip to Purgatory. The home is comfortable and inviting. It had everything we needed during our stay. We enjoyed watching wild turkeys, and beautiful snow storms. We plan to return to this gem! We really enjoyed our stay at the cabin. The kitchen was one of the best stocked I have ever seen in a rental! Everything you could possibly need including extra spices, coffee, several sets of dishes, silverware, bowls, cooking pots and more! We made several fires in the wood-burning stove, which made the whole cabin warm and cozy, even with several feet of snow on the ground. It’s convenient to Durango, yet out in the country. We saw a flock of turkeys daily! Thanks, Gary and Anna, for sharing the cabin with us! Great property. Clean home. Friendly owners. Gary and Ann were great. Everything was clean and they even plowed the driveway when a big snow storm came through. Gary and his family do an amazing job of making you feel welcome. Fire was roaring when we arrived, Gary gave us a brief tour of the cabin and facilities. The cabin is loaded with all the details one might need or desire for a quiet getaway and adventure. The cabin is clean and well furnished, everything worked and the layout is wonderful. There is NO TV, and cell service is spotty, both which create a great week of quiet time and getting refreshed.